Estadio Municipal de Riazor is the home ground of relatively well known Spanish football team Deportivo de La Coruña. Promoted back to the Primera División for the 2014/2015 season, Estadio Riazor is well equipped with a decent capacity of 34,600. 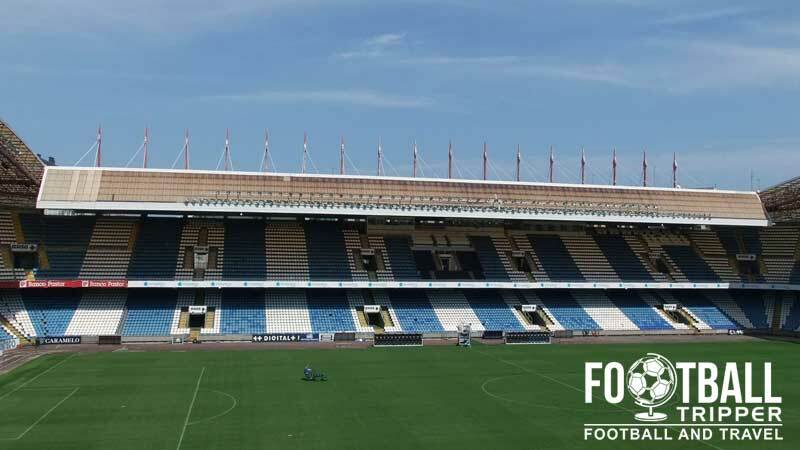 The site on which today’s Estadio Riazor sits has been used to host football matches since the start of the 20th century, and since Deportivo’s formation in 1906, however it wasn’t until 1944 that even the most rudimentary of facilities were constructed. Officially inaugurated with a match against Valencia CF on 28th October which the home side lost 3-2, the large capacity of the ground quickly caught the attentions of Spanish Football and in 1947 was chosen to hold the esteemed Copa Del Rey Final. The match saw Real Madrid defeat RCD Espanyol to give the Galacticos their 9th title and proved to be a success. Estadio Municipal de Riazor was was elected as one of 17 venues of the 1982 World Cup where it hosted three group matches of Group 1 including matches featuring Cameroon, Peru and Poland. Remodelled for this competition, the stadiums capacity was reduced to 28,000 seats however the athletics track was removed much to the delight of local fans. 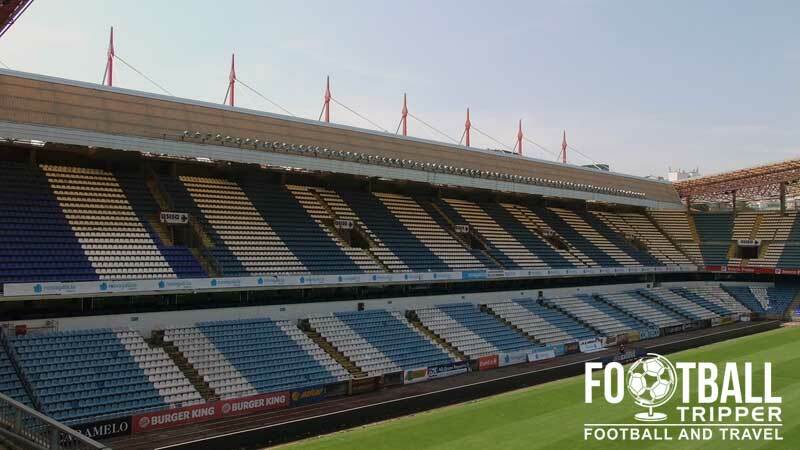 After a second place finish in the 1994/1995 seas Deportivo La Coruna qualified for the European Cup, and thus the stadium was renovated in order to bring in line with UEFA Standards. Previously a horseshoe shape, the ground became fully enclosed with the addition of press boxes, better changing rooms and VIP facilities. 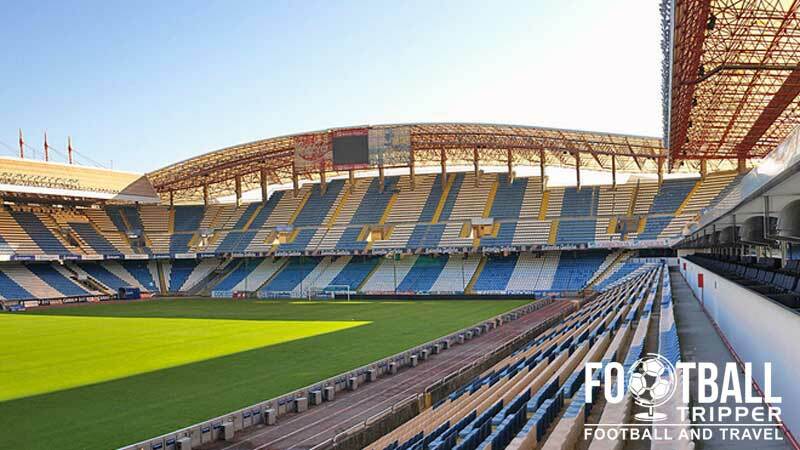 As for the future of Estadio Riazor it appears as if Deportivo already have had plans for a four star, 36,000 capacity stadium ready to go at any minute since 2003 however it is contingent on Spain hosting a major sporting event. Set to be rebuilt on the same site as the current stadium, there was hopes for the 2022 World Cup however it has since been awarded to Qatar. Municipal de Riazor consists of four sections: Tribuna (North), Fondo Pabellon (East), Preferencia (South) and Fondo Marathon (West). Away fans are usually housed within the south-east corner in section 20 which sits between the Preferencia grandstand on Avda. De Le Habana , and the Fondo Pabellon which is the eastern goal-end. The number of visiting fans to this ground and across this ground and Spain is generally low so it’s not uncommon to seat this section more than 75% empty. Located a few hundred metres inland from a glorious of sandy beach you can rest assured that the area is blessed with places to drink. The map below outlines a few of the most popular ones and main areas to drink at. Overlooking la playa there is quite a few independently run restaurants which you can get a quick snack from otherwise there are dining options back towards the historic centre or north-west of the ground along Ronda Outerio where there is a McDonalds. Deportivo operate a club shop at Estadio Riazor as well an official online store. The Tienda is located on the north-east corner of the ground on Calle de Manuel Murguía, and is usually busy up to 90 minutes before kick-off. Monday to Saturday: 10.30 am – 2:00 pm and 5.00 pm – 8.30 pm. The shiny exterior of the so-called Deportivo Tienda or as they call it “Deportienda”. 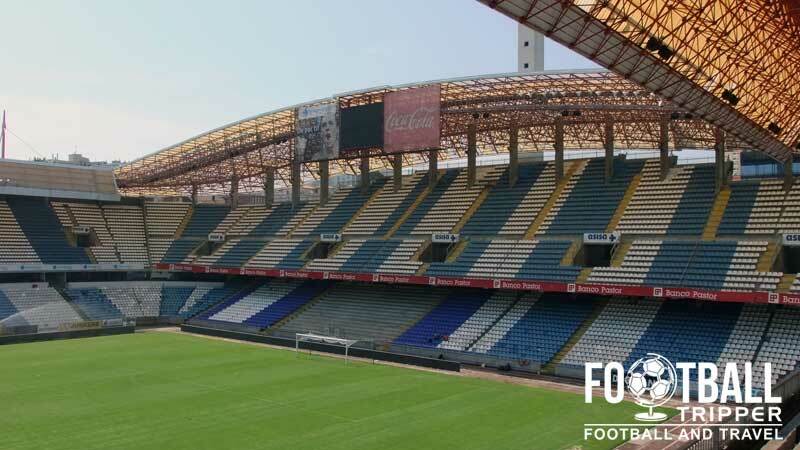 Although there has been some suggestions in the past that Deportivo La Coruna offer fans the chance to undertake a guided tour of the facilities at the Riazor, we’re not currently sure if this is the case right now. If we get clarification we’ll be sure to update this section. Tickets to see Deportivo la Coruna can be purchases online, via telephone (981 22 94 10) or in person at the ticket office which is located between gates 15 and 16 at the back of the south Preferencia stand on Avenida de la Habana. It is open Monday to Friday between 10.00 am to 1.30 pm and then from 4.30 pm to 7.00 pm, as well as for a few hours before kick-off on matchdays. We don’t currently have a comprehensive list of ticket prices available for so please check the official website (link is at the top of this guide). Based on where Google maps defines A Coruna City centre (Casa de las Ciencias), Riazor Municipal Stadium is located 1.0km north, however in reality this distance doesn’t mean much as a lot of the urban area sprawls outwards from the coast which is to the east of the stadium. The exterior of Estadio de Riazor, sharp looking roof supports. Should be twinned with the Gillette Stadium in Boston! As there is no official parking for the general public on matchdays, The club recommends parking at one of the garages located on Rue Gregorio Hernandez. Failing this you can almost park anywhere in the city centre and walk within 20 minutes. The city of A Coruña is served by a single station which shares the same name. Located inland, it is exactly 2.5km from Ciudad Deportiva de Riazor with the resulting walk likely to take the average person just under 30 minutes by foot. 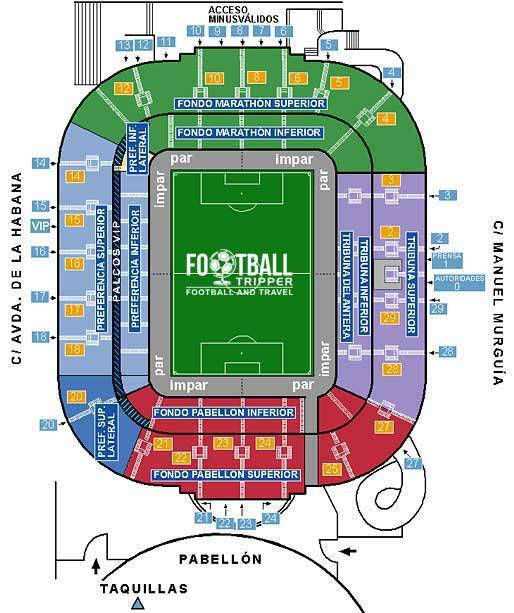 The stadium is accessible via Bus number 3 (San Pedro de Visma and San Amaro) and Bus number 7 (Calle de la Torre) and Jaime Hervada). There are bus stops on both Rua Manuel Murguia and Avenue de la Habana which are the two main roads adjacent to the north and south stands. There is an abundance of hotels within the tourist friendly city of A Coruna with nearby accommodation options to the stadium such as Hotel Almirante, Hotel Corunamar and Hotel Brisa all priced under £30. Expect to pay a little bit more for hotels overlooking the sea such as Hotel Riazor and Hotel Blue Coruna which are 10 minutes east of the stadium.